A great sci-fi classic. When Scott Carey and his wife Louise spend a peaceful day on his brother's boat they never imagined what would happen. After Louise goes below deck to get Scott a beer a strange fog rolls in. Scott is covered in a mist of unknown origins. Once Scott and Louise get back from their vacation, Scott starts getting smaller. The doctors determine that he was exposed to intense radiation but don't know how to help him. 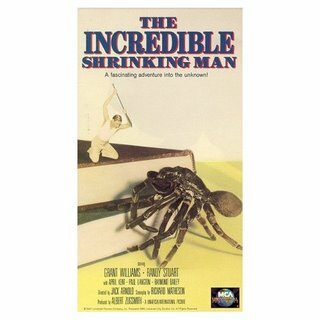 As he shrinks he begins to see the danger in the world around him - a spider, a flooded basement, even his own cat. The ending is very thought provoking. I liked that this movie was not "dumbed down" like so many others like it made in the 50s. I highly recommend it.